It was 8.47pm exactly, on the 24th of December, just last week. I breathed a deep sigh of satisfaction as I laid out fake snow on our front porch as the footsteps of Santa beckoned my children out of their slumber. My teenage nephew was staying over at my house on Christmas Eve, for the first time in his life, as he navigated the complexity of separated parents at this time of year. It was like I was passing on a baton, a tradition, that was unspoken and so very precious. He stirred the fake snow, with a sneaky smile that only a teenage boys can muster. We pulled out the presents and checked incessantly that Mr four hadn’t snuck into the lounge room. My husband was on nightshift so a quick phone call, as he sat in his watch house for the evening and the Christmas hour was approaching. Each year at the beginning of December, we set a timer, that slowly clicks down till the stroke of midnight on the 24th to declare the passing from night to day and the delight of Christmas swelled. 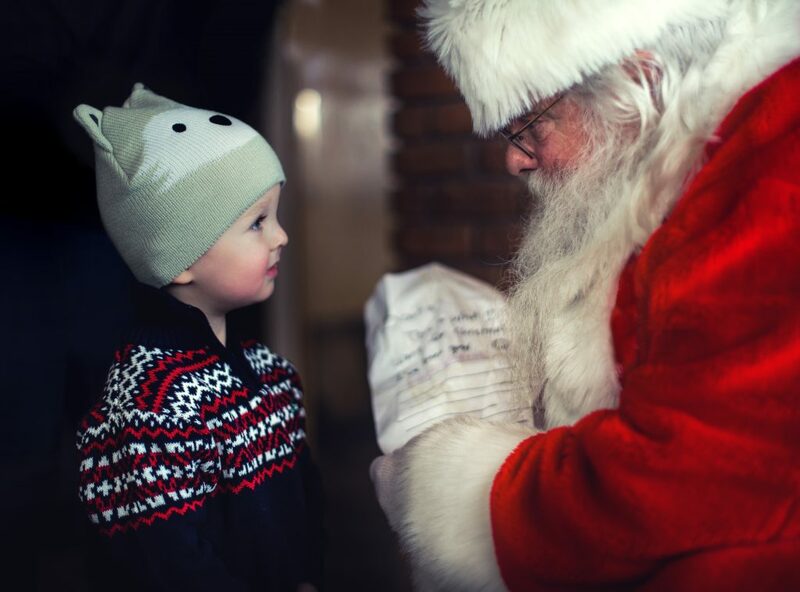 As I lay in my bed exhausted and satisfied, knowing how excited my littles would be and so very grateful for our home, I scrolled slowly through Facebook and read an article about why I should not lie to my children about Santa. I breathed deep and an expert from far off places, shed their opinion on why I am completely ruining my children for life by carrying on with this charade. Christmas passed and I was so grateful at the time spent with family and friends. My children squealed with delight as we celebrated our faith with extravagance and simplicity. On Boxing Day, we gathered with family and then made our way to the movies to watch the latest cartoon designed for littles and we breathed in the popcorn and dark relief. My children smiled and laughed, we sat with our friends in a big cinema enjoying the technology that enabled this delight. That night in bed, I read another article that warned me I should not be taking my children to this particular movie, because of the fear and trepidation from the characters who thrived in red and terror. I lay quietly in bed filled with shame and then something rose up from within and said enough is enough. The problem with the culture that we currently exist in, is that we allow those from far off places to shame us into places we were never created to exist in. You see I am a Mum who is obsessed with imagination. I have no problem with allowing conversations to arise in my family. I passionately believe that story is the language of our heart and a society that exists only between rules and regulation, is a society that is void of lessons, found in the grey borders. I am not afraid of hard conversations. The kind of chats that create colour and light in our world. I live my days igniting my children’s imaginations through fable and story, parable and poem. I read them stories and love to evoke their passion for the beauty in the world and refuse to cotton candy coat the difficulty personified. I’m okay with darkness and I am obsessed with light. It’s about story, expectation and resolution. It’s about imagination and celebration. Its about igniting the passion for life, that the world would try to put out. It’s about lessons and traditions. It’s about patience and times when we don’t always get what we have asked for. It’s about heart break and reward. It’s about forgiveness, friendship and ninja elves. It’s about hope in an age where everyone seems so hopeless. Actually it’s mostly about my family and our traditions. When we sit around a tree, eating crayfish with divorced parents sitting side by side, it’s about breathing in and out. It is about lying in bed with my little man, hearing him talk about footprints on the roof and snow on our front porch. When he finds hope, light and love wrapped in a package that is so much more important to him than the present inside. I’m pretty over black and white conversations actually, where people feel it is their right to tell my family what is and is not okay in the parenting of our children. Psychologists filling the internet pages with should’s and should nots. I’m all about knowledge and expertise, but shaming and confusion is a little rife. For me and mine I choose story, I choose language, I choose delight. I build anticipation and hope into my children’s annual calendar. And when the day comes when they discover it was a fable, a parable told, I will have a conversation and hand over the pilgrimage of hope, shedding light on the importance of story in our fractured world. Celebrating the birth of a Saviour with pomp and screams more like a birthday party than a boring, stale, old chorus that reverberates through dusty theology and rules that engage our shame. I choose chocolate for breakfast and stockings filled with delight. I choose joy and expectation over shame and should’s any day. Our society is rife with opinions and shaming, articles and wiki links. Tread with care my dear friends. The lessons lived inside the lines of a parable is one of the greatest gifts of wisdom. When we live inside stories our hearts and lives are changed. Theatre breathes life into our society. Art brings forth colour and light that would be amiss if snuffed out. We need language, magic, story and light. We need to allow people in our conversations, to have the freedom to choose their own path. Difference and diversity are our greatest strengths, if we embrace the robustness of a life lived unique. What traditions in your family do you feel like you need to defend? Happy New Year, my internet friend, go forth and walk lightly on this earth. Fill your history pages with light and love and you will be forever remembered. I can’t wait for Christmas and Santa to come visit again next year. I love what you’ve written Amanda. I have enjoyed 14 years of snow, footprints and raindeer glitter finishing off with a birthday for Jesus. Even now my teenage boys don’t ever want a Christmas without the “Santa Bag” although I must say it’s gets more expensive and creatively challenging each year. It’s such a precious time in our family’s lives and goes way too quick . Blessing to you and yours this Christmas and New Year. Our greatest story that is retold with delight and extra commentary (my girls are now 22&24) is when they were young -Could not get them to sleep- we were all exhausted and I was in danger of being outlasted by a 4&6 yr old. Never had to donn the outfit again phew … I was informed lovingly I make a terrible Father Christmas BAHAHAHA! !